Enjoy the freedom to have fun with a biking, hiking or zip-line adventure. Feel free to satisfy your historic curiosity with a trip to America’s second-oldest college, The College of William and Mary. Or enjoy the freedom to relax with our amazing array of restaurants, pampering spas and world-class golf. Experience Virginia tourism at its best and find your freedom today! Williamsburg was the capital of Virginia from 1699 to 1780, after Jamestown and before Richmond. Williamsburg hasn’t been politically important for a long time, but now that Colonial Williamsburg is there to represent it in its era of glory, it’s a jewel of the commonwealth. Outside the restored area is a modern city with plenty of dining and lodging options and attractions, including outlet shops and a large water park. But the main draw is still time-traveling into a time of tri-cornered hats. The best place to start with this outdoor museum is at the visitor center. A film and an orientation walk are informative and will save you time. There is so much to see here – buildings, gardens, taverns, trade shops and demonstrations – that it is virtually impossible to see it all in a day or even two. The mini-city is laid out well (think of an 18th-century Disney World), and walking the area is a pleasure. Evening events are held during the summer, so be sure and check those out. Extended summer hours. 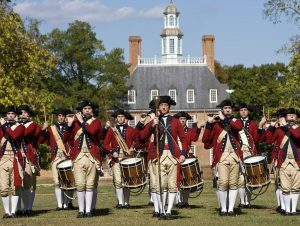 Colonial Williamsburg sells a number of all-inclusive tickets that cost more than a $34 one-day pass. The Freedom Pass ($59) allows you to visit for one full year. The Independence Pass ($72), also valid for a year, includes all the benefits of the Freedom Pass as well as admission to all special events and special discounts. Thrilling rides and villages inspired by Europe and Canada are among the attractions at this family theme park. Tour the French town of Aquitaine and the English village of Banbury Cross, and be sure to pet the Clydesdale horses in Heatherdowns, Scotland. Last but not least, the looping Loch Ness Monster roller coaster and the frightful 205-foot drop from Griffon provide a perfect adrenaline rush. Don’t miss special events at the park: The Busch Gardens Food & Wine Festival each spring, Howl-O-Scream® every fall, and Christmas Town over the winter holidays. The 2705-acre Waller Mill Park, centered around a reservoir, is Williamsburg’s outdoor escape. Locals and visitors come here for fishing, boating and picnicking. Wooded hiking trails and paved biking trails are also available, and your four-footed companions will enjoy the Waller Mill Dog Park. The park rents a variety of paddle boats and kayaks, so pack a picnic and enjoy a day at the lake. The easiest way to explore this college is to get a map (available on campus or at www.wm.edu) and start off on a self-directed tour. Wandering around the school is also an option – the students are not only bright (Phi Beta Kappa was founded here), they are also polite and helpful. For the second oldest college in the country, this place looks fantastic. This is an elegant site full of living history so don’t miss it. There are numerous cultural and arts events held on campus – check out a schedule while you are visiting. Get in touch with your inner monkey at the Go Ape Treetop Adventure Course. New to Williamsburg as of 2012, the staff at Go Ape equip you with a harness, carabiner and training in how to safely use the equipment before letting you run wild on their aerial obstacle course. Ladders, walkways, bridges and tunnels are yours to explore, plus one of the state’s best zip lines. Great fun, particularly if you’re traveling with older children or teenagers. View replicas of the three ships and a fort occupied by the first settlers to arrive at Jamestown in 1610. Historians, dressed in authentic period clothing, walk the grounds and are happy to answer your questions about life at the settlement. Visit the indoor gallery to see 30-minute documentary film and exhibits that document the lives of the English settlers, Powhatan Indians and African slaves who occupied the colony. Based on the L.B. Taylor book “The Ghosts of Williamsburg,” this tour is informative and fun! It is a walking tour of the historic area, so be sure to wear comfortable shoes. Reservations are absolutely required – about 85,000 people per year take this tour, so reserve as early as you can. Tours are held rain or shine. Most major holidays they are closed but do offer tours on Halloween and Thanksgiving. The first museum in the country dedicated to American folk art is on England Street, right across from the Williamsburg Lodge. Refurbished and enlarged in the early ’90s, this museum houses everything from stenciled coverlets to mourning pictures to paintings and sculpture. It chronicles everyday life, as many of the items were once functional and used on a daily basis. Built in 1985 by world-renowned architect I.M. Pei, the museum contains one of the world’s largest collections of historical American and British furniture. Their collection of British pottery is also the largest outside that country. Over 8,000 decorative art pieces from 1600 to 1830 are permanently on display in the 11 galleries. Rotating exhibits are also presented, and a courtyard, cafe and gift shop are located on the premises. When it’s time to take a break from the past, and the heat, head to Water Country USA. Zip down the twisty Jet Scream slide, float along the Hubba Hubba Highway, or splash with the kids in the Kritter Korral. End your Williamsburg vacation on a lighthearted note with a day here. Embrace the rich history that surrounds the conveniently located Wyndham Garden Williamsburg Busch Gardens Area hotel. There is only one hotel located across the street from Water Country USA and closest to the main entrance of Busch Gardens Williamsburg. The Wyndham Garden Hotel Busch Gardens Area let’s you stay in the heart of the theme parks while offering superior service and value! Whether you’re coming to King’s Creek Plantation for a weekend getaway or a week-long vacation, you will find so many exciting things to do right off your doorstep. The exciting story of America’s birth is vividly told in America’s Historic Triangle: Williamsburg, Jamestown and Yorktown. All around are world-class museums, art galleries, theaters, fabulous shopping, exquisite dining, outstanding golf and theme parks, as well as gorgeous scenic trails and waterways. Come Explore, Eat, Play and Shop!